Wendy Wolf creates obsessive repetitive artwork inspired by language and leaves. She was born in 1974 in New York State, received her BFA in Printmaking from Alfred University, and moved to Philadelphia, PA in 2003 to complete her MFA in Printmaking from Tyler School of Art, Temple University. She currently lives in Newton, MA and works in her studio at Wlatham Mills in Waltham, MA. Utilizing processes she developed for herself in printmaking, Wendy has focused on painting and works from paper since 2005. She has exhibited her work internationally, notably at the International Print Center NY, the Sam Quinn Gallery in Philadelphia, the Center for Emerging Visual Artists in Philadelphia, the Independence Seaport Museum, Danforth Art Museum, a solo show at the George School in Newtown, PA, and a solo show at 161 West in Philadelphia. Wendy has completed artist residencies at Taliesin West, Contemporary Artists Center at Woodside, and Beechwood Arts. In 2012, she taught a seminar for teachers at the Philadelphia Museum of Art. In 2013, she completed a large scale outdoor installation in a working shipyard for the show OccupyING the Present at HarborArts in East Boston, the show was reviewed in numerous publications including the Boston Globe, Artscope Magazine and International Sculpture magazine. 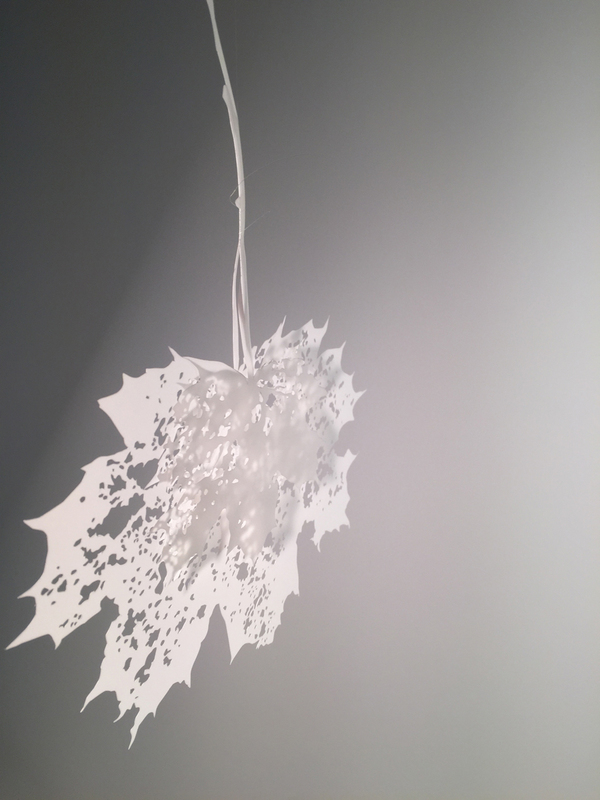 In 2015, she was awarded a solo show at the Bromfield Gallery in Boston, MA and her large scale leaf installation Natural Repetition: Honey Locust Leaves has been shown in NYC, Philadelphia, PA and Alexandria, VA.
Wendy is currently represented by FitzRoy Knox Gallery. FitzRoy Knox has exhibited her work at numerous high end art fairs including SCOPE NYC, CONTEXT Art Miami, Art14 London, and the Affordable Art Fair NYC where her work was chosen as a top pick in the fair by Charlotte Cowles, Senior Editor at Harper’s Bazaar—one of only 5 awards.